“We’re drawn to each other, us messengers. We must be. I remember the first time I saw him, down by the beach huts. There was something about him. The look of him. How could I not go over? Things are bad at home, Frances mother is having a breakdown and her brother is on the run from the police. They have to leave their flat and Frances does not want to move in with her mothers boyfriend. Instead she goes to stay at her Aunts house by the sea. he instantly feels better there but her blackouts, which have been happening more and more frequently lately, are still occurring. After one particularly bad oneFrances meets Peter, an artist who spends most of his time painting postcards from his beach hut. Frances is immediately drawn to him, and him to her, but not for the normal reasons… Peter believes Frances is a messenger, just like him, but Frances has no idea what that even means. The Messengers was such an interesting concept and I honestly had no idea what to expect, but I think thats the best way to go into this book, by not knowing. The uncertainty makes it even more special and you learn about what Frances is at the same time as she does. I have a feeling this review is going to be short because my favourite thing about the book was the concept but I don’t want to reveal what that is. It was worth reading for though and thats all I’ll say. Other than that I liked the characters but they didn’t jump out at me. Peter was probably my favourite, along with Joe and Maxi but Frances herself was too messed up and her Aunt and Uncle were just ridiculously over protective, I’d have gone crazy if they did to me what they did to her. I felt that there wasn’t enough background given between Frances and her mum and their relationship and it didn’t feel real to me… but maybe thats because I’ve not had a relationship like that with either of my parents! The story was good but I felt that it was a little rushed and didn’t have the background I like from my books. As a reader you are thrown in at the deep end and I think I would have liked a few flashbacks rather than the dialogue and narrative memories of past things. There was a fair bit that I thought was shoe-horned in to leave clues for later in the book and I thought they might have been done a little subtler if done in a different way. However saying this I liked that the shortness of the book reflected the urgency associated with being a messenger. Overall this book was worth a read for the concept and I did enjoy it. Hogan’s writing is brilliant and the way he gets the characters feelings across is great, Frances has major mood swings in the book and these only work because of the great writing style. The Messengers didn’t blow me away but I think it has definitely convinced me to go out and buy the authors earlier YA book, Daylight Saving. 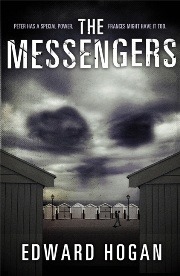 The Messengers was published on September 5th by Walker Books. My copy was given to me in a goody bag from a Walker roadshow event.